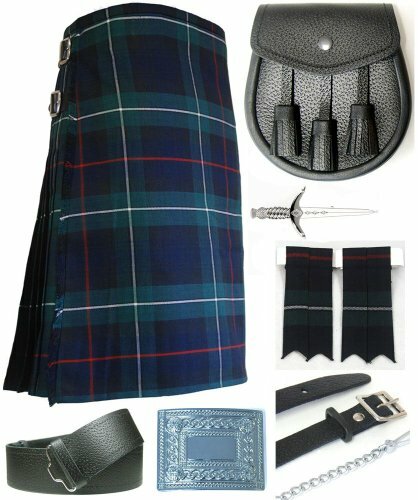 This kilt outfit is a great starter set for those looking to build their first kilt outfit. This versatile outfit looks great when added to your existing wardrobe - try it out with a cool t-shirt or shirt for a unique look. The sizes are in inches. A good tip for measuring a kilt waist is to measure snugly around the waist at navel height. If you need any advice on measuring, please let us know and we will be happy to help. Please note, this item ships from Scotland and delivery to the US usually takes around 7 working days. Mens Scottish National Tartan 7 Piece Full Dress Kilt Outfit Size: 34" - 36"
Kilt Society Mens 7 Piece Casual Kilt Outfit- Black Watch Tartan with White Hose 34" to 38"